Every Good Friday afternoon I could look forward to two things: spending a good part of the day in church, and watching my grandmother and mother make an enormous pie for Easter, called pizza chena. I never knew what that meant in Italian until many years later, when studying the language, I realized that pizza chena was dialect for pizza piena, which meant "a very full pie." And it was - chock-full of meats, cheeses, and a dozen eggs! While I have reduced the number of eggs, this still remains a substantial and memorable pie. It looks impressive when made in a round or rectangular pan at least 2 1/2 inches deep. In a large bowl, sprinkle the yeast over 1 cup of the warm water, stir well, and let proof for 5 to 10 minutes, or until foamy. Add the remaining 1 1/2 cups water and stir well. In another bowl, mix 5 cups of the flour with the salt. Add to the yeast mixture along with 1 teaspoon of the olive oil. Mix with your hands, adding additional flour if necessary, until a soft and no longer sticky dough is formed. Turn the dough out onto a floured surface and knead it until smooth and elastic. Lightly grease a large bowl with 1 teaspoon of olive oil, add the dough, and turn to coat. Cover tightly with plastic wrap and let rise in a warm place until doubled in bulk. Preheat the oven to 375ºF. Brush the bottom and sides of a 15 by 13-inch rectangular baking dish or a 10 by 3-inch springform pan with the remaining 1 1/2 teaspoons olive oil. Punch down the dough and knead it on a floured surface for 3 or 4 minutes. Divide the dough in half. On a floured surface, roll one piece of the dough to a rectangle or round at least 2 inches larger than the pan. Fit the dough in the pan, stretching it up the sides so that it overhangs the rim. Fill the pan with alternating layers of the sliced cheeses and meats (you should have 9 or 10 layers). In a bowl, whisk together the eggs, Parmigiano-Reggiano cheese, parsley, and salt and pepper. Pour the mixture evenly over the cheese and meat. Break a lemon-size piece of dough off the remaining piece of dough and set aside. On a floured surface, roll the second piece of dough out to a rectangle or round at least 1 inch larger than the pan. Place the dough over the filling and seal the edges by pinching them closed and rolling the seam underneath itself. Divide the reserved piece of dough in half and roll each piece into a rope. Lay one piece across the center of the pie, and lay the second piece across it to form a cross. Brush the top of the pie evenly with the egg wash. Bake for 35 to 40 minutes or until the crust is nicely browned. Remove from the oven and let cool completely. If using a spring form pan, release the spring, transfer the pie to a serving plate, and cut into wedges. If using a rectangular pan, cut the pie into pieces in the pan, then transfer them to a serving dish. Note: This pie will keep for up to 1 week in the refrigerator. It is best served at room temperature or just slightly warm. This recipe is from Nella Cucina by Mary Ann Esposito. This recipe is featured on Season 6 - Episode 605. 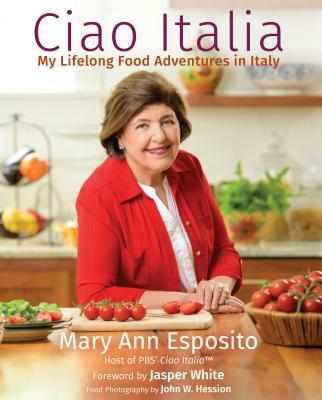 THANK YOU SO MUCH MARYANN..I MAKE PIZZA CHENA EVERY YEAR FOR EASTER..MY CHILDREN,GRANDCHILDREN & FRIENDS LOOK FORWARD COMING TO MY HOME FOR EASTER,''I'M THE ONLY ONE THAT MAKES THIS,WHICH IS A GOOD THING.AT LEAST I KNOW THATS ONE HOLIDAY I KNOW THEY WILL ALWAYS SHOW UP FOR...P.S.I ALSO MAKE YOUR RICOTTA PIE THEY LOVE,THANKS AGAIN,THE SCERBO FAMILY,PA. Lisa, yes I know; I am using the dialect and written word as used in my family that always called it pizza chena which we know means piena or full pie. Joanne, you probably did not seal the dough so it got air and formed a crust. The sour smell is from the fermentation of the yeast giving off alcohol. Punch down and use as you normally do. Mary Ann, We make this recipe every Easter. Can this be made ahead and frozen? Every year I try and the egg leaks out. My family loves this as do I. I find it easy, but this always happens. In addition to that there is a pocket between top crust and the filling. Am I supposed to make an air slit on the top crust? PleSe help. Johanna, As I remember it growing up, the filling had chopped boiled eggs. This added to the texture. My Mom always used hard boiled eggs and ricotta also !!!! No two Italian cooks cook alike--even in the same family. My mother was from Guardia Lombardi de Avellino--in the Campana region as is Naples. We don't use a yeasted crust but rather a dough used to make taralli (our way--egg, flour, oil & lots of pepper). The result was a thin crust with lots of filling. That filling is a "clean out the refrigerator" whatever inspires the moment. There is no wrong way. We even spell it pizza cena (cena meaning dinner). We share the spirit of the end of Lent. My mother's region used raisins in everything from meatballs to lasagna. Pizza cena is no exception. It adds a nice sweet counterpoint to the savory meats and cheeses. My grandmother made this in a big springform pan. It was amazing. I made it once, years ago. I find that now that I have a grand daughter, I want to re-introduce these traditional Easter foods. We called it Pizza Gaina but we also called another Easter cheese and ham bread cooked on a cookie sheet Pizza gaina. My grandmother used the basket cheese and cubed ham and made a stromboli or large "turnover" shape and baked it on a cookie sheet.